A gorgeous exploration of the relationship between the haute couture of Dior and the fashion photography that captures it. Reaching beyond the intimate setting of the fashion show, the photographer paints a portrait of haute couture that takes the couturier's intention to enchant the public and elevates it to the level of the sublime. Published to accompany the Dior and Fashion Photography exhibition presented at the Musee Christian Dior in Granville, France, this lavish volume presents a large amount of gorgeous photographs that bring the character of the couturier's dresses to life, with each photographer interpreting them in his or her own unique style. 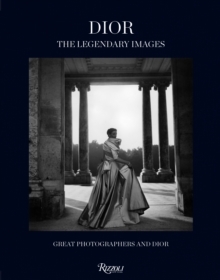 Legendary contributors include Horst P. Horst, Richard Avedon, Irving Penn, Cecil Beaton, Norman Parkinson, Henry Clarke, William Klein, Helmut Newton, Guy Bourdin, Sarah Moon, Paolo Roversi, Nick Knight, Ines VanLamsweerde and Vinoodh Matadin, Tim Walker, Willy Vanderperre, Patrick Demarchelier, and many more.